Republican freshmen sitting in Democratic-leaning districts continue to dominate the list of the 10 most vulnerable House incumbents. But since this list was last compiled in early July, a few members have changed spots. Candidates have filed another quarter&apos;s worth of FEC reports, and after the summer conventions, the presidential contest is more solidified. 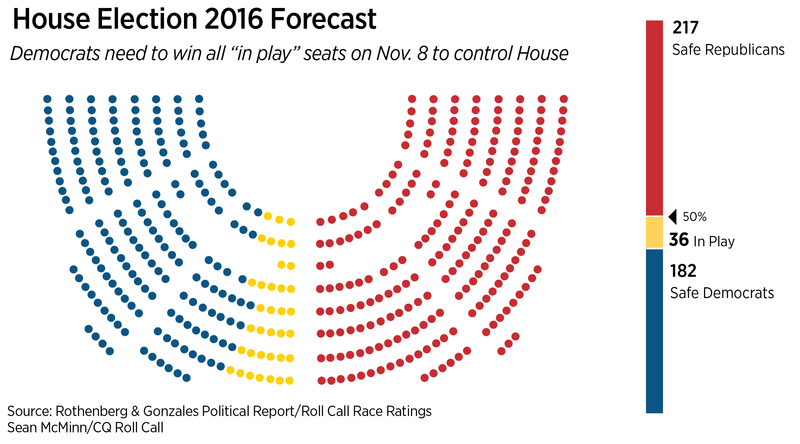 Democrats must gain 30 seats to take the House majority, and they are increasingly giddy that Hillary Clinton&apos;s widening lead over GOP rival Donald Trump will expand the number of districts in play. Meanwhile, Trump&apos;s missteps continue to cause headaches for vulnerable Republicans. Some of these incumbents are outperforming Trump, and the GOP presidential nominee may actually be a boost in a few rural, working-class districts. But whether that&apos;s sustainable for the next two months is hard to say. Once again, no Democrats appear on this list. That doesn&apos;t mean there aren&apos;t a few vulnerable Democratic members. Nebraska Rep. Brad Ashford is sitting in a district that Mitt Romney won by 7 points. California Rep. Ami Bera&apos;s father was just sentenced to prison for illegally soliciting contributions for his son&apos;s campaign. And Minnesota&apos;s Rick Nolan is facing a repeat challenge from an emboldened Stewart Mills in a mining-heavy district that could be sympathetic to Trump. But vulnerability is all relative, and there are simply many more Republicans defending more Democratic-leaning seats this year than there are Democrats in precarious districts. In fact, several other Republicans could have made the list. Colorado&apos;s Mike Coffman, for example, sits in a district President Barack Obama won by 6 points in 2012. Clinton is leading in the state by double digits. Like New York Rep. Lee Zeldin, Coffman&apos;s race is rated Tilts Republican. But Coffman doesn&apos;t make the list, and Zeldin does. Coffman is not on the list because he&apos;s a four-term incumbent who&apos;s said he&apos;ll try to distance himself from Trump. But Zeldin is a freshman who has embraced the GOP nominee. Those differing strategies say a lot about their respective districts. It&apos;s likely Trump will be much less of a drag — and actually, a potential boost — in working class Long Island than in Hispanic-heavy Colorado. And if that bears out, Zeldin — who&apos;s already dropped several spots on this month&apos;s ranking — may be even less vulnerable the next time we compile the list. Rankings are based on The Rothenberg & Gonzales Political Report race ratings, fundraising reports, district fundamentals, polling, and conversations with operatives on both sides of the aisle. Jolly, who spent most of the year running for Senate, climbs from No. 3 to No. 1 in his re-election race against former Gov. Charlie Crist. He&apos;s pledged not to solicit campaign donations, and he&apos;s unlikely to get any help from the National Republican Congressional Committee in this heavily redrawn seat. With the NRCC adding him to its Patriot Program for vulnerable incumbents and reserving ad time in the district, Blum slides down from first to second. He had much more cash on hand at the end of the second quarter than Democrat Monica Vernon (with plenty of personal money to bolster that coffer if he wants). But as a member of the House Freedom Caucus in a district Obama carried by double digits, his re-election still looks daunting. With Trump polling poorly in the Granite State, Guinta slides up one spot. Despite his FEC troubles, he looks more likely to survive his Sept. 13 primary than he did several months ago. Democrats would be glad to see him win because he still has high negatives that will dog him in a general election. Hardy was back on the trail last week just days after suffering a minor heart attack. Also last week, he had an awkward "don&apos;t-endorse-but-support" Trump moment. But with the GOP presidential nominee faring relatively better in the Silver State than elsewhere, and Rep. Joe Heck running a strong race for Senate, Hardy falls two spots. Trump will still be a factor in this race, though, especially with a Hispanic Democrat challenging Hardy in a district Obama twice won by double digits. Dold is credited with running the kind of campaign he should be to outperform Trump in a heavily Democratic district. But the last time Dold ran against Brad Schneider in a presidential year, he narrowly lost. And with Trump expected to do worse in this Chicago-based seat than Mitt Romney, Dold is staying put at No. 5. Like Dold, Curbelo has carved out a moderate path, saying he won&apos;t vote for Trump. Also working in his favor? Democrats didn&apos;t get their preferred candidate in the Aug. 30 primary. But Trump&apos;s effect on a heavily Hispanic district that became slightly more Democratic in redistricting leaves Curbelo in a tough spot. He moves up two spots. Katko drops a spot. Trump may be less of a drag on down-ballot candidates in upstate New York than other places. Katko ended the second quarter with 16 times more cash on hand than Democrat Colleen Deacon, who had to spend in the primary. Still, he&apos;s vulnerable in a Democratic district that Obama twice carried by double digits. Poliquin climbs a spot. He hasn&apos;t done himself any favors by continuing to dodge questions about his support for Trump, and Democrat Emily Cain has been outraising him lately. Polling shows a tight race. But Poliquin has a $1 million campaign cash advantage (as well as a lot of personal wealth) in a rural district that might be more receptive to Trump than some of the others on this list. Zeldin drops two spots in his race against Anna Throne-Holst, over whom he had a huge cash advantage after her primary. Supporting Trump may actually not be much of a drag on down-ballot candidates here, and Zeldin knows it. But some of the freshman&apos;s comments (like calling Obama a racist) could still come back to haunt him. This is where the rankings get fluid. Any number of lawmakers, including Democrats like Bera — whom recent GOP polling has shown in a very tight race — could arguably occupy this spot. But Hurd takes the honor because he&apos;s running in a heavily Hispanic district against a former incumbent who&apos;s achieved closer fundraising parity than many other challengers. Iowa Rep. David Young, who previously held this spot, is still very vulnerable in a district Obama twice carried, but he had a significant financial edge over his opponent at the end of the second quarter.